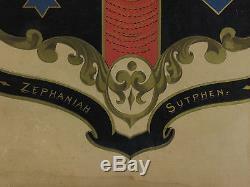 We are pleased to offer this rare original Civil War Soldier's Broadsheet Record for Private Zephaniah Sutphen of Company "B" 14th New Jersey Regiment of Volunteer Infantry Army of the Potomac. 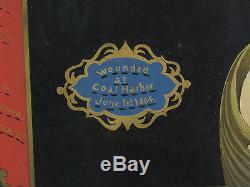 He was wounded at Coal Harbor in June 1, 1864 and discharged on June 28th, 1865 in Trenton, NJ. He participated in the battles of the Wilderness, Spottsylvania, Spottsylvania C. Po River, North Anna, Hanover C.
Cold Harbor and on detached services on Bedloe's Island, NY Harbor, from summer of 1864 until June 28, 1865. 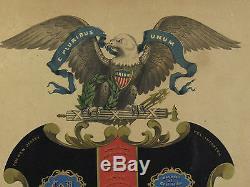 Enclosed in his unit's shield with an eagle, a union shield on it's chest and a banner that reads, E Pluribus Unum. Overall it's in very good condition with vibrant colors. Minor water stain to lower left, see photos. One minor 1/8 bookworm hole where it abuts the liner on the left hand side, very difficult to notice. The image area measures 17" x 23-1/2" Bright Colors! It comes in it's original Victorian walnut frame with ebonized shadow molding, retaining it's gold liner 21-1/2" x 29" in exceptional condition. 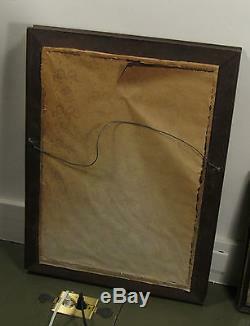 Appears to retain it's original backboards. Feel free to ask me any questions. Photos are a good representation of the object. Check out my other items. Be sure to add me to your favorites list. 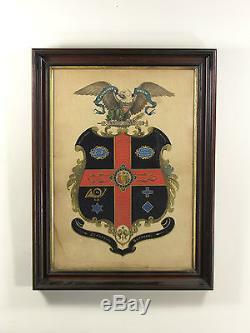 The item "Civil War Soldier's Record 14th New Jersey Co.
B Vol INFANTRY Roster Hatchment" is in sale since Thursday, March 03, 2016. This item is in the category "Collectibles\Militaria\Civil War (1861-65)\Original Period Items\Documents". The seller is "aurorejules" and is located in Dover, New Hampshire. This item can be shipped worldwide.